What is a MyRouteYou Premium? 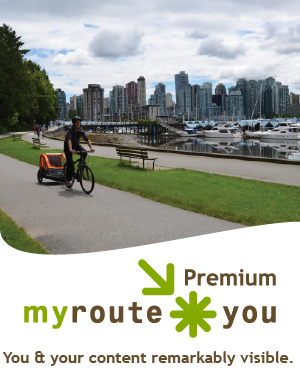 What does the MyRouteYou Premium include? A MyRouteYou Premium account allows you to get extra exposure for your organisation and your content with your own branding on your RouteYou channel. This page brings you a summary and price overview of the MyRouteYou Premium product. The provided functionality in the MyRouteYou Premium account is targeting those parties that want to take the use of RouteYou a step further for professional purposes. It is a reduced version of the MyRouteYou Pro account. Check out the overview of all functionalities per account type. Your header and logo at the top of your homepage (1 and 2 on the image above), each of your routes and groups with a link to your website (or any other). You can manage these by yourself. Extra links to your Facebook, Twitter, Youtube, Pinterest, TripAdvisor, ... channel (3 on the image above). You can manage these by yourself. Clear visibility via the 'Channel Search' (see here) and 'Related Channels' (different pages on www.routeyou.com). You can create your channel in different languages. You get a handy tool to add images and links to the description of your channel. You have an overview (graphics) from the exposure (views) from your content on RouteYou: in general and per type page (routes, downloads, locations, your home page, ... Read more about it here. Contentcode: With a contentcode you can offer (a set of your) routes in the free RouteYou App for smartphones for your customers/guests. Read more about it here. You get a Basic Support Pack which means support to you or your organisation for the use of the RouteYou platform. Read about the RouteYou Promo Suites. Read here about the MyRouteYou Pro account. Read here about the MyRouteYou Enterprise account. (*) Includes all RouteYou Widgets except the RoutePlanner. The RoutePlanner Widget can only be used as part of a Professional Services License. Idem for use of the Web Services. With the Advanced Support Pack you get extra support. Read more about it. Online by clicking the 'Upgrade' button and walkthrough the paymentflow. For even more posibilities, check out the RouteYou Promo Suites and the MyRouteYou Pro account. For a list of the RouteYou functionalities per type of account: have a look at the RouteYou Functionality Overview per accounttype.